wheremmsgather: CCEE and DDC or is that DDC and CCEE? I have a couple posts to share with you this fine Monday morning for two different challenges. My first one is from a Doubledog Dare Challenge (DDC) I hosted a couple weeks ago and have been so remiss in getting done. A couple of my good buddies from that group haven't let me forget it (you know who you are--giggle). I actually started this card mid week last week, but just couldn't seem to finish it up until yesterday. My challenge to the group was to use the crayon resist technique. For those of you who may not be familiar with this technique, it is quite simple to do. Supplies you will need are glossy cardstock, black Stazon, white crayon, brayer and/or sponge dauber, and a paper towel. Stamp your image onto the glossy cardstock with the black Stazon (I prefer the Stazon because it doesn't smear). Highlight the parts of your image that you want to remain white with the white crayon. You can then either brayer or sponge your ink over the image and then wipe away the excess ink with a paper towel. Your white crayon will "resist" the ink you sponge. You can see that I stamped the image from Embrace Life over my entire piece of glossy cardstock because I wanted it to be my background designer paper. I then used daubers to sponge on Gable Green and Taken with Teal ink. 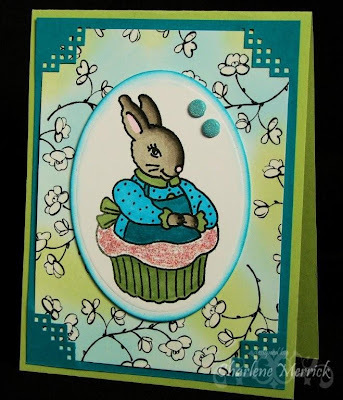 And isn't this mama bunny (from Stamps & Smiles) cute? My friend Cindy Haffner sent our CCEE challenge group this image quite some time ago as a part of a challenge we did, and this was one of the extras I still had on hand. I enjoyed coloring her with my Copic markers and putting pink glitter on the frosting of the cupcake. Wanna play along with our DDC challenge? Check out the details at Splitcoaststampers here post #31. My next card is for my weekly Monday challenge with my CCEE (Cheers & Challenges Eager Eight) buddies. Frances, aka StampOwl, was so sweet to purchase this adorable digital image from Mo's Digital Design for each of us (thanks, Frances!). I love Mo's illustrations; what a talented artist she is. Doesn't this young lady look like such a dreamer? I thought she'd be perfect for a young woman who has been doing a student internship in our office this summer. Her time with us has come to an end (sniff). This image is also colored with Copic markers and highlighted in spots with white gel pen. If you'd like to play along with us, check out the details on our CCEE blog. You can also see the cute cards my friends made. That's it for now. Thanks for stopping by and visiting my blog today; I always appreciate it! I'll be swinging by yours as well! Charlene your cards are so pretty, I love them both. I love them both too.....great images and colors on each!! Two fabulous cards for two challenges Charlene!! I especially love the pink bg for your digi image!! It really makes your beautifully colored image pop!! LOVE the green eyes too!! I never thought of coloring the eyes, and it's so striking!! Your bunny is so cute and beautiful coloring. The little girl is totally cute, such a fun image and I love the stars you added. I love your crayon resist and the cute bunny Charlene!! Gorgeous coloring!! I love that digital by Mo!! Gorgeous coloring and design. I am sure it was very well received!! These are both fabulous, Charlene! Love the little bunny card! Way too cute! The digital image is precious! So beautifully colored! I just can't believe someone in our little group would harass you about the crayon resist challenge! TeeHeeHee! These are both great. You have been busy. I love the digi image. You really colored it well. I think the bunny image looks great with the two brads you added. Super job on both. My goodness, Charlene! Your coloring is divine. That bunny and adorable little girl are just perfectly shaded and colored...will you teach me? What darling cards. You really have the mojo working with your Copics. Gorgeous coloring on both cards. And your crayon resist background is beautiful! you did such a great coloring job on your image, charlene...love the shading! great card! Whoohoo!!! I must say that the sweet little bunny card was well worth the wait!!!!! What an adorable image and your resist is PERFECT!!!!!! You deserve an extra M&M serving for being such a good girl!!!! Speaking of little girls, your CCEE card is precious...I love the beautiful image and your coloring is over the top, Charlene!!!!! Charlene, both of these are fabulous!!! Wonderful colors and coloring on both!!! Awesome work!!! Looks like you have been busy stamping.....ain't that grand???? Just adorable Charlene! Your coloring is fantastic! These are both so pretty, Charlene!! The colors are so pretty and your coloring is so perfect! !